BLOG - BETWEEN A ROCK & A HARD PLACE: Benny Gallagher goes 'Backstage'! "David Mundell's passion for music and his ability to create Venues which provide an ambience that actively encourage and regularly produce great performances, has won the respect of both Performing Artists and the Public over the years. He made The Famous Bein Inn Music Pub Of The Year 2002 - one of six finalists in the Publican Awards in 2003 - one of three Finalists with SLTN in 2007 - and The Inn @ Lathones Music Pub of the Year in 2009 and one of six finalists in the Publican Awards 2010. "What time do you want me on stage"? For sheer quality and distinction you need look no further than the career of Benny Gallagher. 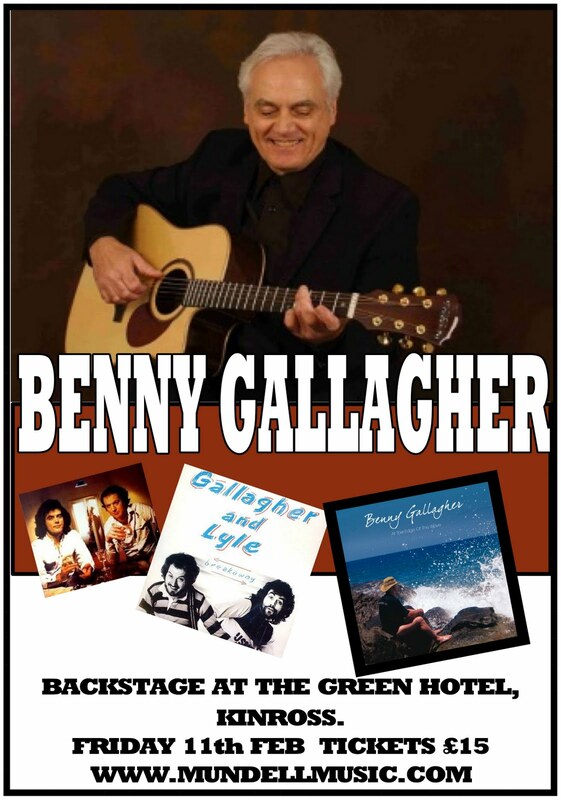 One half of hit makers and blue chip songwriters Gallagher & Lyle; he began his career as a staff writer with the Beatles Music Publishing Co. Apple, writing songs for Apple Records biggest artist Mary Hopkin. Benny has always considered his days at Apple and especially the constant encouragement of Paul McCartney, as the single most important factor in his development as a songwriter.